About an hour ago, Amazon announced they will be buying Whole Foods for $42 a share, a 27% premium to the closing price on Thursday. Whole Foods is the 70th largest grocery chain in the world based on 2016 revenues and has over 430 locations. So why would Amazon go through an acquisition that is close to 14 times larger than any of their previous acquisitions? 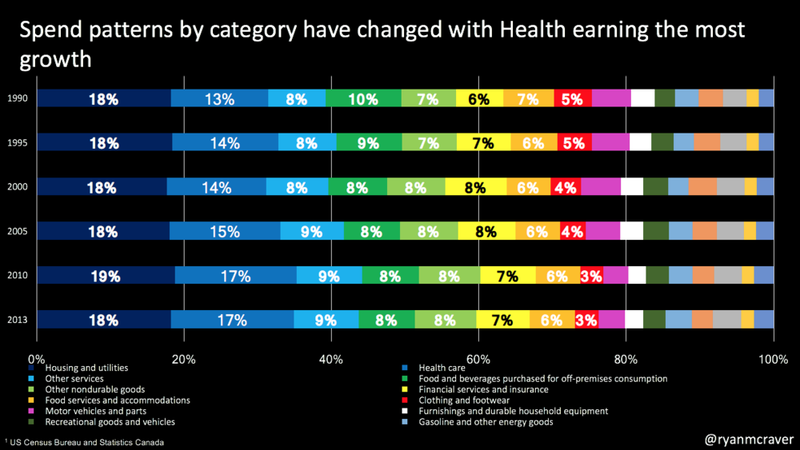 Access to your grocery wallet - Sales of food and beverages is the #4 category consumers spend money on aside from housing, health and other services. Whilst that number has gone down over the years, consumers still spend 8% of their wallet on food and beverages. Buy on Amazon.com, pick up in store - Amazon has dabbled in buying online picking up in lockers and just started Amazon Fresh pick-up but never had a physical presence allowing for customers to come to Amazon locations for pick-up and avoid their highest cost driver: shipping costs. Physical flexibility - Amazon is a big believer in empowering sellers through their marketplace. With the additional brick & mortar space, I wouldn't be surprised to see Amazon lease or consign unit space to sellers looking to sell product both online and in-store. Sellers can use that shelf space for marketing a product to the Amazon customer beyond just the site and apps. Now, whilst this is game changing news, we must keep the size of the grocery market in perspective. 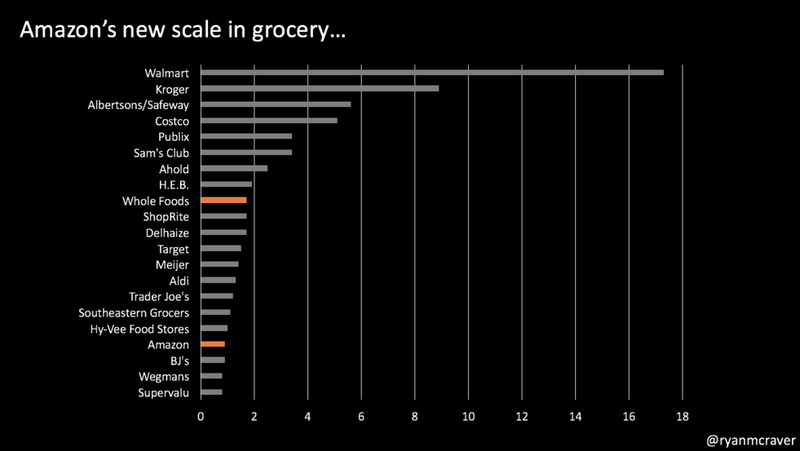 Amazon currently owns about 0.9% of the total grocery market. Whole Foods currently owns 1.7% of the total grocery market. While this is a significant increase in market share for Amazon, it still pales in comparison to the top two. Walmart has 17.3% and Kroger has 8.9%. Amazon's combined market share will be 2.6%. Whilst we fantasize about a checkout free store visit, Whole Foods private label brands available on Amazon and buy on Amazon.com, pick-up at Whole Foods, we must remember that deals of this size take time. Deals of this visibility sometimes see other bidders. Deals of this size take a lot of work operationally. We won't see approval until the back half of this year and likely won't see any change in operations until at least next year.